Our premium card options printed with your own pictures and greetings let you be intimate, friendly, or professional as desired. You can create your card design in minutes with our free online greeting card creator. Add your personal greetings and pictures into one of our pre-made designs, or create your own from scratch. Count on us for your customized thank-you cards, beautiful wedding invitations and more. Stylize your order with matching envelopes, and choose from some of the finest papers like Pearl, Cotton and Brown Kraft to make your cards extraordinary. Let us help you celebrate your holidays and special events in style - choose our customized greeting cards to make birthdays, holidays, anniversaries, birth announcements, Christmas cards and any other event exceptional. Show your environmental care this holiday season with 100% Recycled Brown Kraft Greeting Cards and Light Brown Kraft Envelopes, produced with fast Same Day Service! Choose 16pt Pearl Silver Greeting Cards to enhance your holiday cheer! Colors print vibrant on this white, iridescent and lustrous stock; and matching Pearl Silver Envelopes are available to complete your greeting cards set. Design your greeting cards today. What Screen Printing options are available for Greeting Cards? If you would like to order a different colour Screen Printing colour; or a custom stock (such as Premium Black, Cream Pulp or even Wood) please place a Print Quote request. We can also combine Screen Printing with embossing or other print finishes for an even more impressive product. As this is a labour intensive process – the number of orders we can accept is limited; so submit your Print Quote request as soon as possible to let us know your needs. There are many options for Screen Printing, such as the ink colours and stock. The standard option offered on our website is Brown Kraft card with white Screen Printing. How can I create my Greeting Card design? We offer several layout templates for Greeting Cards and Tent Cards to help you set up your files. Please download the appropriate layout template for the product you are ordering – if it is not available, you can also request a layout template. Below are some points additional to our File Setup and Preparation guidelines specifically for Greeting Cards, Tent Cards and other hald-fold cards. The "flat size" is the size of the card when unfolded and flattened. 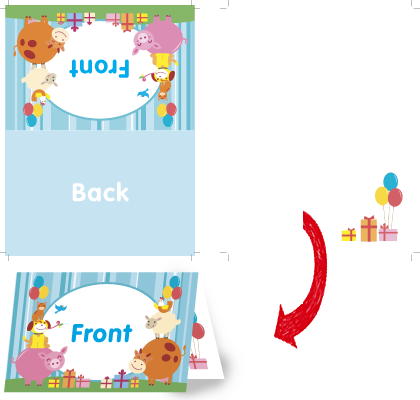 The folded size is when the card is folded in half (as if to fit in an envelope) – one of the dimensions (either the width or height) will be half when compared with the flat size. We recommend a safety margin of 0.125 inches from the score line (this is where the card gets folded). Any important text or graphics should be kept away from this area. For Digital Output products dark colours should not be used across the score line as the ink may crack along the fold line. When preparing your file for print, please note the orientation of the panels so that when folded the card is correct. If you are going to be writing on your greeting card, please see: Which coatings be written on? Once the files are prepared, export a press-ready PDF file as per our print specifications. There are a few several considerations to include when preparing files for printing a Greeting Card. The same set-up can be used for tent-cards (business card size) and other half-fold products. Can I print different designs on each Greeting Card? Premium Offset Greeting cards cannot be printed dynamically due to the printing method. We call this service "Dynamic Printing". Dynamic Printing is available for Digital Output Greeting Cards at an additional cost. Please submit a Print Quote request for pricing and ordering. Can I get envelopes too? If the type of envelope you would like to order is not available, or you would like printed envelopes – submit a Print Quote request. Yes, we offers blank envelopes to fit all our Greeting Card sizes. These can be added to your order before payment. What can I use Greeting Cards for? Popular uses include Invitations, birthdays and special events, direct mail, product launches, vouchers, promotions, thank you cards, save-the-date cards, gift certificates – the options are endless. Make cards for every holiday throughout the year from New Years day through to New Years Eve: Easter, Halloween, Thanksgiving, Christmas and more! Every day can be made special with custom Greeting Cards. Slight shifting will occur between the printing, trimming and scoring processes, which is unavoidable for any printer. As such, we do not recommend to attempt to register your printed design perfectly along the score lines, as some shift is likely to occur. This can cause unwanted results, such as part of the artwork to shift over onto the next panel. Leaving a margin of 0.125" between your artwork and the score lines will help avoid this from occurring.